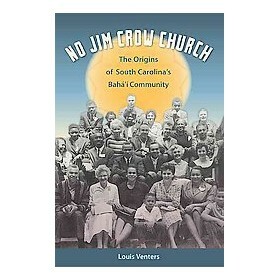 Louis Venters’ remarkable book No Jim Crow Church: The Origins of South Carolina’s Bahá’í Community is possibly the best piece of history written about the American Bahá’ís to date. While it focuses on the Bahá’ís of South Carolina from 1898 to 1968, the book is also superbly contextualized, both in terms of South Carolina’s social and religious history and in terms of the development of the overall American Bahá’í community. As such, it provides a richly detailed exploration of a microcosm of the American Bahá’í community and a paradigmatic example of the trends of the American Bahá’í community as a whole during a crucial period of its history. Although numerically insignificant and apparently powerless during the period under review, South Carolina’s Bahá’í community accomplished a remarkable feat that was without real parallel: in the midst of a political and religious culture that denied the humanity of people of African descent in virtually every department of life, they created an interracial religious fellowship in which blacks and whites participated fully, unitedly, and as complete equals, from the local level up. The very presence of such a community, forged in the interstices of Jim Crow South Carolina, undermined both the practical mechanisms and the spiritual underpinnings of white supremacy. No Jim Crow Church details the initial resistance of white Bahá’ís to their new Faith’s high standards of interracial fellowship as well as the external opposition from churches, politicians, and the Ku Klux Klan. The seventy years of slow but steady growth detailed in the book set the stage for the Bahá’í Faith becoming a mass movement among some of South Carolina’s African American community in 1969–71. That made the South Carolina Bahá’í community the largest community by state in the United States for a time and catapulted the Faith to the status of the largest non-Christian religion in South Carolina, larger, by some counts, than Jews, Muslims, or Buddhists. The book’s six chapters and a coda cover developments in chronological order. “First Contacts, 1898–1916” describes the arrival of the Bahá’í Faith in South Carolina through the efforts of a African American lawyer, Louis G. Gregory, who was a resident of Washington, D.C., but a native of Charleston. Gregory’s efforts to desegregate the Washington, D.C., Bahá’í community set the pattern of racially integrated local Bahá’í communities across the United States and resulted in his election to the national Bahá’í coordinating council in 1912, the first African American so to serve. But the fate of the first South Carolina convert—Alonzo Twine, a black attorney in Charleston, who was committed to the state’s insane asylum by his family and his minister, apparently because of his new found faith—underlined the immense resistance to conversion to a non-Christian religion that both whites and blacks faced in the south. Chapter 2, “The Divine Plan, the Great War, and Progressive-Era Racial Politics, 1914–1921” reviews Louis Gregory’s numerous trips across the South and his (and others’) efforts to teach the Bahá’í Faith in churches, colleges, and public halls. The Tablets of the Divine Plan, a series of letters from the head of the Bahá’í Faith, ‘Abdu’l-Bahá, to the North American Bahá’ís, stimulated a great outpouring effort to spread the Faith. But black churches often attacked the Bahá’í Faith and the NAACP—which was trying to establish chapters across South Carolina in the face of violent opposition—was not a receptive audience. “Building a Bahá’í Community in Augusta and North Augusta, 1911–1939,” Chapter 3, covers the establishment of the first Bahá’í community in South Carolina in a wealthy white suburb of Augusta, Georgia, thanks to the efforts of a German music teacher. But in spite of the universal appeal of music, the community achieved only partial racial integration. Nevertheless, it was a center of activity that brought some two dozen people into the Bahá’í Faith, scattered across the state. Chapter 4, “The Great Depression, the Second World War, and the First Seven Year Plan, 1935–1945” reviews the effort to spreads the Bahá’í Faith systematically across South Carolina through the agency of a regional teaching committee that coordinated the flow of visiting teachers and “pioneers” (Bahá’ís who moved to a place to help establish a Bahá’í community). Growing Bahá’í communities in Nashville, Tennessee, and Atlanta, Georgia, developed experience in achieving full racial integration, but fledgling communities in North Augusta and Greenville continued to have a much more difficult transition. The mayor of Greenville, however, allowed the Bahá’ís to use the City Council Chamber for their meetings, as it was the only public place in town where interracial meetings were possible. “Postwar Opportunities, Cold War Challenges, and the Second Seven Year Plan, 1944–1953,” Chapter 5, discusses further growth as the civil rights movement began to weaken the Jim Crow system. The Greenville Bahá’í community grew stronger, a community was established in Columbia, and groups of Bahá’ís began to form all across the state. Louis Gregory, in his old age, was able to return home to meet South Carolina Bahá’ís, who numbered about thirty. Chapter 6, “The Ten Year Plan and the Fall of Jim Crow, 1950–1965,” covers a period of rapid change. Systematic and vicious attacks on the NAACP forced more than half of its local branches to close by 1957 and created an atmosphere that made it very difficult for the Bahá’í communities. In response, Shoghi Effendi, the head of the Bahá’í Faith, advised American Bahá’ís in the South to concentrate their teaching efforts on the black community, rather than trying to reach both blacks and whites. The white Bahá’ís had to adjust to being the minority members in their religion, and efforts to spread the Bahá’í Faith turned to the Midlands and the Lowcountry where the majority of the population was African American. The results were surprising. Not only did the number of black members increase considerably, but more whites joined as well. In 1961, a white Bahá’í attorney in Columbia was able to obtain a legal opinion that Bahá’í marriages were legal in South Carolina, in spite of the fact that community lacked a minister to officiate. Bahá’í communities were able to legally incorporate. Bahá’ís became actively involved in civil rights protests. By 1963, the membership of the South Carolina Bahá’í community grew to eighty adults and probably an equal number of children and youth. The growth of the Bahá’í Faith among black Americans achieved a notable milestone in that year when the first Universal House of Justice was elected—the religion’s nine-member international coordinating body—and one of the nine was African American, Amos Everett Gibson, from Washington, D.C.
No Jim Crow Church ends with a Coda “Toward a Bahá’í Mass Movement, 1963–1968.” It reviews the plans to expand the Bahá’í community between 1964 and 1973, the great success of the civil rights movement to dismantle Jim Crow, and the increased vibrancy of the Bahá’í community itself, which nearly doubled to 132 members in five short years. The developments set the scene for efforts at door-to-door teaching in the rural African American districts of the Lowcountry, which by 1971 brought in as many as twenty thousand into the Bahá’í Faith. No doubt that story will require a future volume. No Jim Crow Church is superbly well written and extensively footnoted. If anything, one could complain that the book offers too much context, but for those unfamiliar with the history of racism and civil rights in South Carolina, the context is welcome. In the process of describing South Carolina Bahá’í history, the book reviews every major development in American Bahá’í history, from its founding in 1894 to the end of the turbulent 1960s, and thus provides an excellent overview of the history of the national community as well. Overt errors of fact are few; this reviewer only noted one (‘Abdu’l-Bahá’s visit to North America ran from April to December 1912, not February to September). For those wanting to know what claims the Bahá’í Faith makes and why it has grown as quickly or slowly as it has, the book is a ground-breaking introduction.